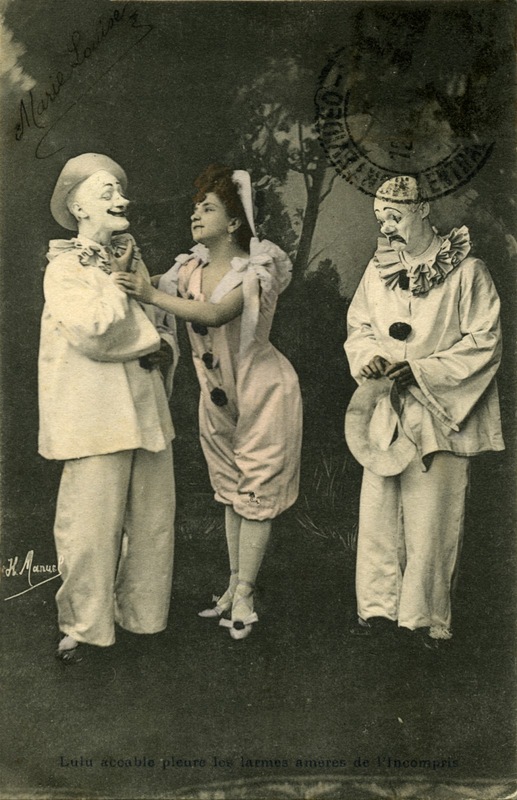 I have to admit that I'm stumped by the inscription on this postcard, 'Lulu accable pleure les larmes de l'Incompris.' As that my French is inexistant, I'm unsure of the grammatical structure of this statement — something to the effect of, 'Lulu is overwhelmed by the tears of the misunderstood.' Oui? Non? There is an opera, Lulu, written by Alan Berg in 1937. However that date is inconsistent with the 1903 postmark on the back of this postcard. Berg's opera was based on two plays by Frank Wedekind, one of which, Erdgeist, was written before the postmark on this card. Regardless, the postcard's image is wonderful. Feel free to leave a comment if you have any information on the story being depicted here.